This is the complete review as published on the online magazine Elettronica Open Source. Archimede is a starter kit very attractive, simple and complete. This is an Open-Source and Open Hardware project that is proposed as the perfect platform for all those interested in home and generic automation. Today we start a short series of articles in which first we will take confidence, and then lay your hands on, to best explain what Archimede is and why we consider it a valid choice. Archimede, as we said at the beginning, and as stated in the official documentation, is a platform open-source (and open-hardware) based on the firmware of the Cerberus card by GHI Electronics. The objective behind the creation of this platform is to provide the user all the potential of its expansions, learning to use them when needed, and creating a structure that is easy to program. In order to achieve this, it has been done a fairly interesting choice: taking advantage of the wave of success of the .NET framework released by Microsoft years ago, the choice fell on the .NET Micro Framework, doing it in order to have hardware ready for use. In regard to this, with this kit, and some minor expansion, you’ll soon be able to create home automation projects of great value.Since it is a universal device controller, modular and quite versatile, the possibilities, especially with regard to the hardware, are so many, and you’ll find them very useful if you want to do simple experiments remaining hobbyists. When you’ll be familiar with the programming, as well as with the hardware, however, you will certainly be interested to push over and head off to his field more “noble”: of course we are talking about building automation. And now let’s understand the terms used talking about the kit, as well as official name, because the card is configurable and modular, as we have mentioned, to meet every need. 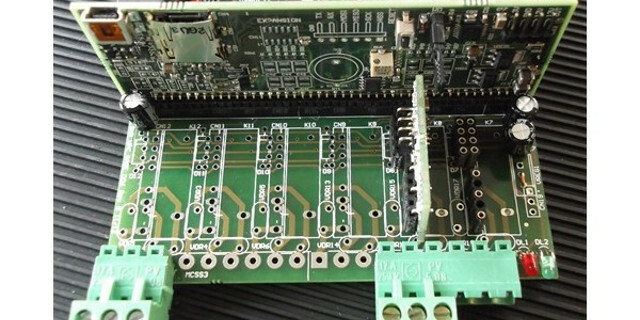 The architecture is quite simple: there is a baseboard that can accommodate a CPU and up to as many as 12 relays or 12 expansion boards and / or 24 opto-isolated digital inputs. This architecture was a choice that made the whole system very well adapted to almost any need. Archimede starter kit is only the “basic” version, actually; it is essential to learn to use the full potential of the system, which also can be programmed in Visual Studio environment. And if you do not know where to start, a short series of code examples and demos will give you the boost you need. You will find programs and applications from a wide variety as well as libraries in C # and Visual Basic .NET. 2 PWM hardware up to 1MHz. At least 3GB of hard disk space for installation of the development environment and the various SDK. About the SDK, if you want to know how to get what you need, there’s a handy link ready for download, directly from the website or by simply clicking here. There is already a large number of cards I / O can be used with the kit and development continues but, on the other hand, as we have said, this is all open source. It seems an interesting challenge to develop your firmware for this platform, also managing expansion cards, don’t you think? Well, now we’re done. We hope to have interested you enough. As we previously announced, articles about Archimedes will come out the other, we’ll deal with it again and you’ll see the work. Meanwhile, for all who are already interested, please note that this information is already among the final prizes of our contest. Yes, because if you go and have a look you’ll find it among the prizes that will be awarded at the end of the contest, or in December. For those unwilling to wait for the awards in December, or would like information on any event, you will find everything to this address. It, however, during this period is discounted by 35%!